Our pride and joy are the 25+ (the number changes constantly!) pigs we raise for ourselves and local market in the heart of the Willamette Valley near Mt. Angel, Oregon. The pigs are primarily Yorkshire crossed with Hampshire, Tamworth, Poland China and/or Poland China. We sometimes have a few pure Hampshire pigs, as well. Standard pork is raised on a high protein grain based diet in confinement, reaching market weight in as little as six months. Our pigs enjoy juice pressings, , sweet corn, kale, fruit and assorted vegetables from the orchard and garden. This method takes longer, but produces a product we believe is unparalleled in taste and texture. We also purchase locally milled grain from Union Mills (a local mill which has been in business since 1877) as well as wheat, barley, corn, oats and hazelnuts (filberts) from local farmers which we use to grind our own feed blend at least weekly, on site. The combination of fruit and vegetables, grain, exercise and time provides excellent marbling and flavoring in the meat, which you will not find in your standard “grocery store” pork. Our mama pig with piglets . . . Some Fine Pig consists of my father, Carl Buchholz (75 years of local farming and livestock raising experience), my wife, Alicia (mortgage industry management professional) and myself, Carl Buchholz (I recently worked in the local tech industry providing guidance in environmental and regulatory matters as well as related product marketing, positioning training). The combination of good friends, suppliers and sustainable practices provide ourselves and our customers with unique products and experiences not available elsewhere. Let us know if you would like a whole or a half pig and when you would like to have it ready. We usually have pigs ready every few months, but are often booked out a quarter or more in advance. We will do our best to accommodate your schedule. A month or so before the pigs are ready (we usually raise them to about 260-300 pounds live weight) we will let you know so you can plan for your pork. Next, we schedule a local processor to harvest the animals on site. This minimizes the stress to the animal, resulting in a better quality product. The animals are then taken to a local butcher (we recommend Voget’s Meats in Hubbard, Oregon - www.vogetmeats.com/ ) . Once there, they are hung in a cooler for 2-3 days to thoroughly chill. At this time, we will contact you with your cost and payment based on the “hanging weight” plus the harvest fee and Vogets will call you to let them know how you would like your pork processed. Vogets will walk you through your options as to how you would like your pork processed. Examples are how thick would you like your pork chops? Do you prefer ham or sausage or both? What type of sausage would you like—breakfast, Italian, etc.? Processing times will vary, but you can expect to pick up your meat at Voget’s in Hubbard, OR in about 10 days. When your meat is ready, the butcher will contact you to come and pick up your order. At this time, you will need to pay the butcher costs directly to Voget’s. What kind of pig will I get? At this time, we do not have any purebred pigs for sale. Instead, we raise some of our own Poland China/Yorkshire cross piglets as well as source piglets from a neighbor. Breeds are typically a Yorkshire blend with Poland China, Berkshire, Hampshire, Tamworth and/or Duroc. We do have a few 50% Large Black Hog and 50% Berkshire coming up for spring 2014. These breeds (Berkshire/LBH) are known for the additional marbling and darker meat. After many years, we have found these pigs offer the best vitality and quality product. If you would like a specific pedigree, please let us know and we will do our best to accommodate. A general rule of thumb is about 28% of the live weight is discarded, so a 250 lb pig will yield about 180 lbs of hanging weight. Depending on what type of cuts you would like (boneless pork chops, etc.) you can expect about 135 lbs of ham, sausage, ribs, chops, etc. The chart below illustrates the estimated percentages of different cuts. A half a pig generally fills a large camping cooler, once cut and wrapped. How does this compare to buying from a butcher shop? Here is a breakdown of what you can expect, but remember, this is your pork and you can choose to have some of the roasts, hams or hocks put into sausage, choose boneless or bone in pork chops, etc. The figures below do not show head and feet since these are generally not included unless you request USDA processed pork. 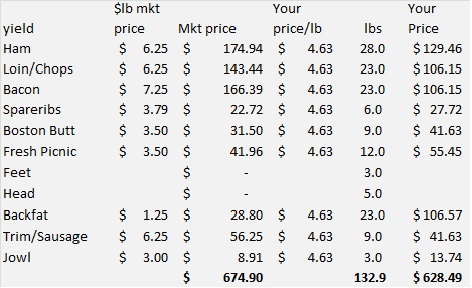 Remember, these prices are for a locally, sustainably raised animal, not a feedlot animal, shipped from outside the state or region. so it doesn't hurt to ask if we're running a promotion. Harvest fee is $45 per whole animal.&nbsp; Cut and wrap (butcher) fees vary, but are usually about 55 cents per pound.&nbsp; Curing (sausage, ham, etc. )&nbsp; is approximately 65 cents a pound.&nbsp; Based on these prices you can expect to pay about $628 for a whole pig or $314 for a half a pig.&nbsp; Current prices are based on a $2.40/lb hanging weight. but we often run specials &nbsp; If you are looking for resale, we will need to have a USDA slaughtered pig.&nbsp; Give us a call and we can get you the latest pricing. We are confident you will be pleased with your custom order and look forward to doing business with you.